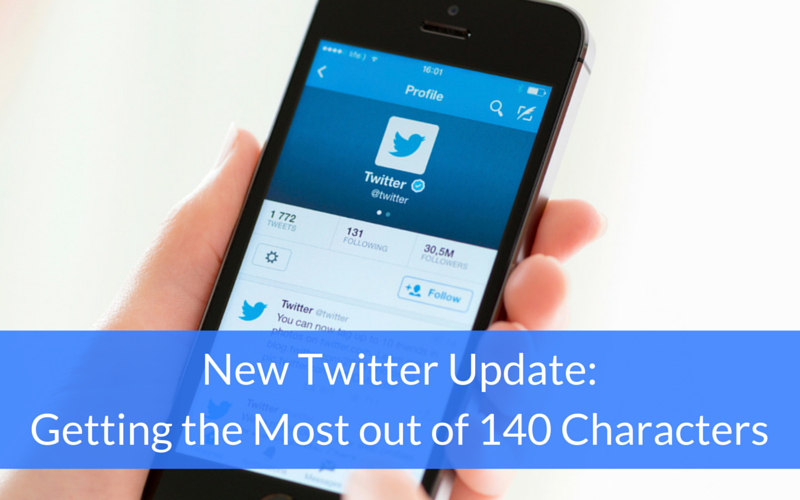 Recently, Twitter announced that we’ll finally be able to get a little more bang out of our 140 character tweets. So what exactly is Twitter talking about and how will this benefit you? Read on to learn more. The tweet used to be solely comprised of text. No URLs, no videos, photos, or Vines, not even hashtags. In fact, it wasn’t until over a year after the first tweet was sent in March of 2006 that the hashtag debuted on Twitter in August of 2007. Even the @reply appeared before the hashtag, entering the Twittersphere in November 2006. Next came promoted tweets, which launched in April of 2010, and then the launch of Vine in January 2013. Most recently, Twitter has added the ability to react with GIFs, create polls, and share Periscope broadcasts. Just think about all the times you’ve had to abbreviate your tweet into oblivion in order to accommodate a picture or another user’s handle. Now, things like GIFs, videos, photos, poles and @names in replies won’t be counted towards the 140-character limit. You can attach up to four photos, or one GIF, video, poll, or Quote Tweet without losing any characters. @names will no longer be included in the character count. This only applies to the @names auto-populated at the start of a reply (and not elsewhere in the tweet). This also means that you can’t simply tag a ton of people you want to address; it can only be used for replies. You can now retweet or quote tweet yourself to add additional thoughts or commentary on a previously posted tweet. 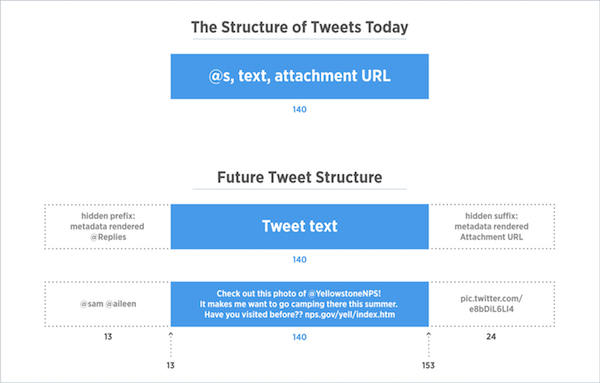 Here’s an awesome graphic from TechCruch that compares the structure or “scaffolding” of today’s tweet versus the one we can expect to see in the near future. Ultimately, these changes will affect Twitter’s conversation style, how people self-promote, and overall engagement and information density. First of all, tweets will be wordier; meaning tweets including media will no longer be concise. However, this will also mean you won’t have to jump into and out of the media viewer, making your experience more user-friendly. On another note, the ability to retweet yourself creates more opportunities for self-promotion. Don’t get too carried away with this one or your followers might leave you. Lastly, as TechCrunch points out, “the information density of Twitter will be diluted.” In fact, there’ll be up to 17% more text in your feed. This may mean that less people will read your tweets as they’ve already suffered from information overload. How do you feel about the new Twitter changes? How do you think they’ll affect your business’s social media plan?